SUMMARY: Researchers have identified a link between oral health and the onset of dementia. You may be aware of all of the social and dental upsides of good oral hygiene, but did you know that it could benefit your brain function as well? Researchers have found evidence that there might be a link between poor oral heath and age-related mental decline. In coming to this conclusion, researchers compiled a number of studies on oral health and cognition, published in the two decades between 1993 and 2013. 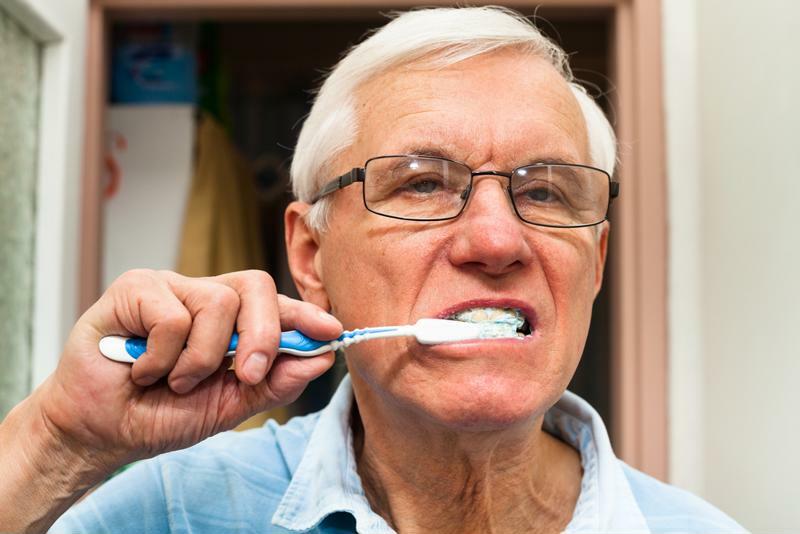 While some failed to reveal a link between oral care and mental function, others revealed that indicators of an unhealthy mouth, like missing teeth, cavities and gum disease, were correlated with the onset of dementia as the individual aged. Based on the sum of this evidence, the authors of the paper, which was published in April in the Journal of the American Geriatrics Society, felt safe identifying a connection. Said author Bei Wu in a news release, "clinical evidence suggests that the frequency of oral health problems increases significantly in cognitively impaired older people, particularly those with dementia." Wu was cautious not to say that a causal link could be made yet, emphasizing that more evidence would be necessary to make such a direct connection. There could be multiple factors that underscore this correlation. Oral care is vital for seniors. Dr. Jacqueline Sobota, a dentist at North Shore University Hospital, has speculated that there is a shared inflammatory pathway that is present in both oral and neurological diseases. Dr. Gayatri Devi, a neurologist and memory loss specialist at Lenox Hill Hospital in New York City, has suggested that the link might be tied to something known as apraxia, whereby a dementia patient forgets how to perform an everyday ritual, such as tooth-brushing. In this situation, the decline in mental health would be tied to the decline in oral health. As the number of senior citizens rises, this issue will become increasingly important to track. Future studies will look to test broader, more representative population samples, in hopes of identifying a cause for the connection that researchers have seen. In the meantime, tending to your oral hygiene remains a critical component of overall health, and an important daily routine for all people, regardless of age.